I've put myself on a complete spending ban after making this feel unique order. I've bought most of the products on my wishlist so I shouldn't feel the need to buy anything for a while. I did manage to get £10 off my order though which I was really pleased about. I made two orders and used the code "highfive" for £5 off orders over £40 and then I randomly got £5 off my other order without using a code. Instead of just showing what I bought I thought I'd share my first impressions, sort of mini reviews as I've been using them all for a couple of weeks. Also as these have all been hyped/written about on blogs I probably wont be writing full reviews for most of them. Caudalie Beauty Elixir - This was sold out when I tried to get it in London so I'm glad I managed to get it a little bit cheaper online. I went with the smaller bottle as I wasn't sure on the scent or how it would work on my skin. I've been using it for about 3 or 4 weeks now but I don't really know what to make of it. Firstly I don't like the scent but I don't hate it, it's a minty scent which is ok. I haven't noticed much changes in my skin and I seem to be going through it pretty quickly. Still unsure if I'll buy another once this runs out. 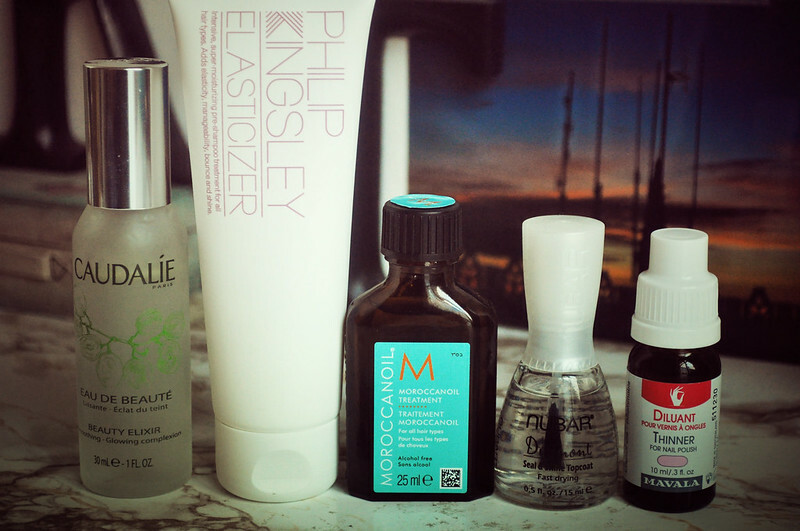 Philip Kingsley Elasticizer - I bought the smaller tube as I haven't tried this before even though everyone raves about it. If you've never heard about it before, elasticizer is a pre-shampoo treatment that is meant to leave your hair feeling and looking amazing and that it certainly does. I've only used it once so far but I really noticed a difference in how soft my hair felt the next morning. So far so good! Moroccan Oil - I finally caved and ordered this after hearing & reading so many raves about it. I love V05's oil which is really cheap so I have high expectations for this. I haven't used it enough to form a proper opinion on it yet. Nubar Diamont Seal & Shine Topcoat - I needed a new top coat as I'd finished my one from Orly last month. I am going to repurchase it at some point but decided to try a new one for the time being. I went with Nubar's Diamont topcoat as Fleur raved about it in her June favourites. I've only used it a couple of times so far but it's in joint first place with Orly's Polishield. Mavala Nail Polish Thinner - As I have quite a big nail polish collection it means I don't use every polish that much. Some of my older polishes or the ones that don't get used too often have started to go gloopy. Instead of throwing them away I'm going to try to thin them down with this. I've never used a nail polish thinner before but I'm hopeful it'll work. Anyone tried one before? 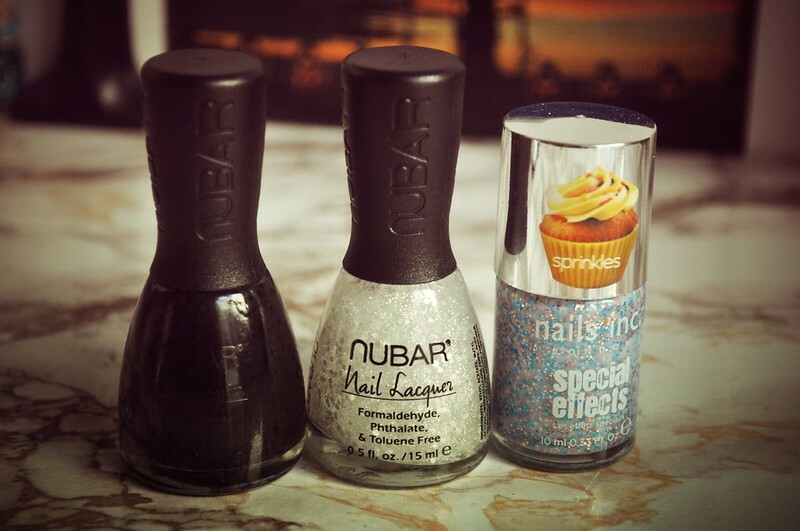 Nubar Black Polka Dots, Nubar White Polka Dots, Nails Inc. Sweets Way - These three have all been on my nail polish wishlist for a while now. I'm particularly loving the black polka dots as it goes with whatever polish you already have on. I'm letting my nails breath for a few weeks and not wearing any polish as they're in horrible condition at the moment. Once I start wearing polish again I'm sure I'll be posting NOTD's of these three first. I tried this nail polish thinner and it's quite nice :) Although it did nothing to my Seche Vite...seems you have to buy their thinner.